1. Criollo (T. cacao var. cacao). The word criollo means “native”, as it is distributed from southern Mexico to South America, north and west of the Andes. Fruits are oblong to ovoid in shape, tapering to a point, and have five or ten longitudinal ridges; seeds have yellowish white cotyledons. 2. Forastero (T. cacao var. sphaerocarpum). The word forastero means “foreign”, as it was introduced to Mesoamerica from the Amazon basin. The fruits are ellipsoid to round, lacking a pointed tip, and may be furrowed but have a smooth surface otherwise. The cotyledons are violet. Forasteros are higher yielding and more vigorous than criollos, but considered to have inferior quality. About 80 to 90 percent of cacao production is based on the forastero form, due to its superior yield, vigor, and disease resistance. ‘Amelonado’ is the major West African cultivar, and the predominant type grown worldwide. 3. Trinitario (hybrids of Criollo and Forastero forms). These hybrids, which originated in Trinidad, are sometimes classified as a subgroup of the forasteros. Since they are hybrids, they are highly variable from seed, unless the seed is derived from known crosses. The seed quality is intermediate between that of the criollos and the forasteros, as are other characteristics. Cacao is thought to be native either to the upper reaches of the Amazon basin exclusively or to a wider region stretching northward into present-day Chiapas, Mexico. The Aztec and Maya were cultivating cacao in Mesoamerica long before European contact and are credited with the domestication of the criollo form. They made a drink called chocolatl (also “Xocolatl”) by grinding roasted cacao seeds with maize, vanilla, chili, annatto, and other spices. Chocolatl, said to have the consistency of honey and a bitter flavor, was a drink prized by all but consumed mostly by the elite. Cortez is credited with bringing cacao back to Spain in the early 1500s. Once sweetened with sugar, cocoa became a popular beverage throughout Europe, at about the same time that coffee and tea were catching on. 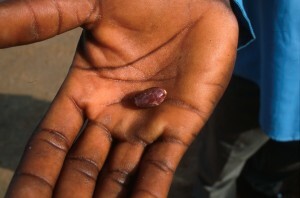 It did not arrive in West Africa until about 1879, but today this region produces most of the world’s crop. Cocoa was consumed only as a beverage until about 1828, when the cocoa press was invented. This allowed cocoa powder to be separated from cocoa butter, which together with sugar are the basic ingredients of solid chocolate. The popularity of the beverage declined as solid chocolate became a major commercial product. In 2001, the global cocoa confectionery industry was valued at $73 billion, up about 20 percent from 5 years earlier. An evergreen, understory tree, capable of reaching 45′ but generally grows to 15 to 25′ in cultivation. A seedling will grow a single vertical shoot for a distance of several feet, at which point the apical meristem divides into three to five pieces, producing a whorl of lateral-growing branches called a “jorquette”. The upright-growing shoots are called “chupons”—basically what we would call “water sprouts” or “suckers” on other fruit trees. 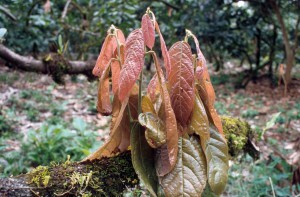 Cacao exhibits a flushing-type growth habit, with two to four growth flushes per year. Leaves are short-lived for a tropical evergreen and generally drop after two flushes. Leaves average 4 to 8 inches long and 2 to 5 inches wide and are glabrous, with entire margins and acute to acuminate tips. Leaves on new flushes are pink to red and hang down vertically. Cacao is extremely well adapted to shade and most often grown with an overstory tree crop. Flowers are small (1/2 to 3/4 of an inch) and white to pink in color, borne in compressed dichasial cymes of a few to several individuals. 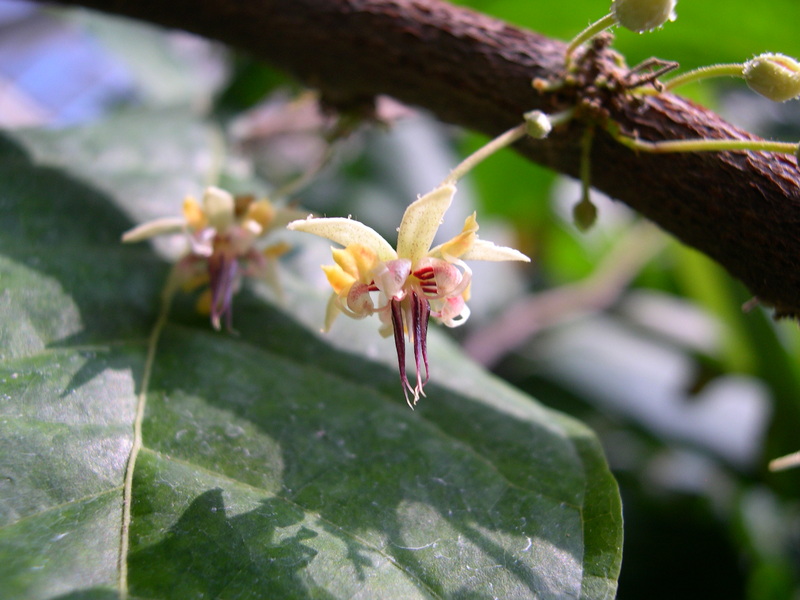 Cacao is cauliflorous, with flowers arising on old wood at the site of a former leaf, called a “cushion”. Compatibility is highly variable in cacao, with some types being highly self-incompatible and cross-incompatible with some other cultivars as well. Self-incompatibility is higher in criollo and trinitario types, but ‘Amelonado’, the major forastero cultivar, is self-compatible. Cacao is insect pollinated, by a unique and diverse group of pollinating insects compared to other fruit crops. Midges of the genus Forcipomyia are the primary pollinators, but those from Dasyheolea and Stylobezzia are also involved, as are some species of aphids and thrips. The fruit, erroneously called a “pod,” is best described as a pepolike berry. They are 4 to 12″ long, less than half as wide, and are borne singly or in small groups on the main stems and older wood. The outer portion of the fruit is leathery, usually ridged or lobed, and about 1/4 to 1/2 inch thick. The bulk of the fruit volume is occupied by the seeds, arranged in five longitudinal rows along a central axis. Seeds are in fleshy, mucilaginous, sweet arils, and have either white (criollo) or purple (forastero) cotyledons. Fruits are either red or yellow at maturity, mature year-round, and are self-thinning. Deep, well-drained, loamy soils with a slightly acidic pH are best. Complete or partial clearing of tropical rain forests is often practiced to find sites with appropriate soils. Cacao is native to and cultivated in hot, wet tropical lowlands in a belt between 10°N and 10ºS latitude. 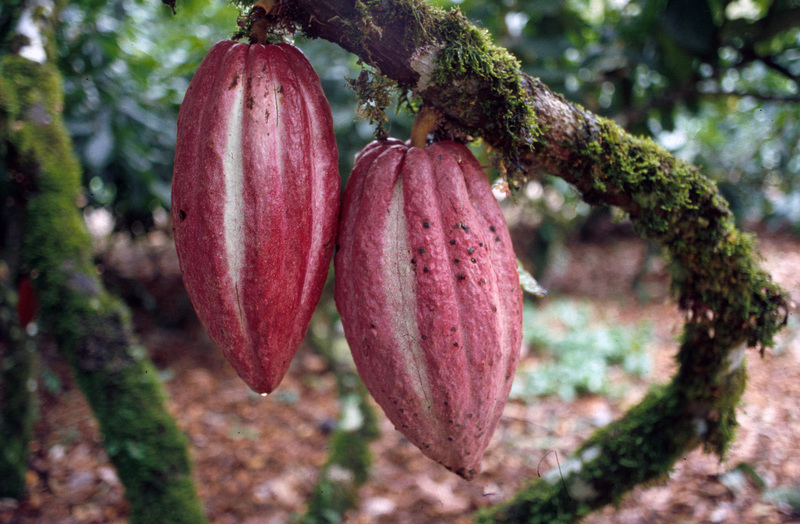 Cacao plantings are developed either by thinning existing forest or clear-cutting and planting shade trees in advance of the cacao. Shade trees are planted 20 to 60 feet apart, and forests are thinned to leave 2 to 3 very large trees and 15 to 20 smaller trees per acre. Cacao plants are spaced 8 to 16 feet apart beneath the shade in either case. 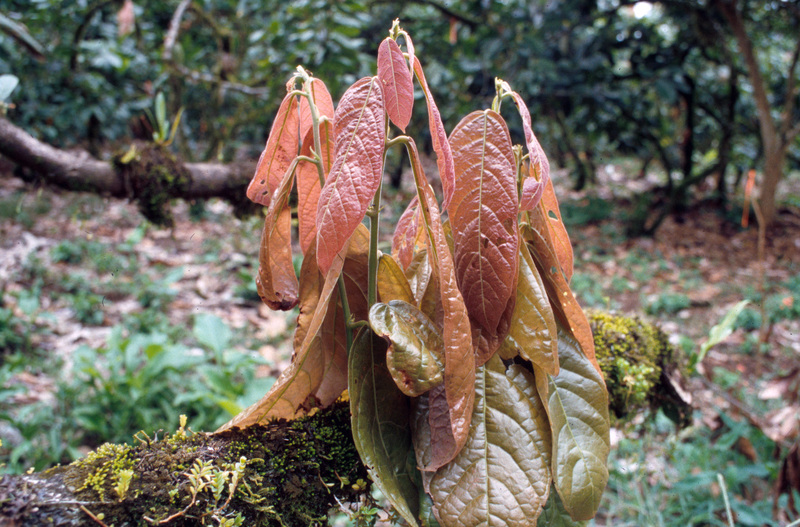 Very little pruning or training is required in cacao production. Fruits change color when mature; the red ones darken and develop an orangish cast to the furrows, and the green pods change to yellow. 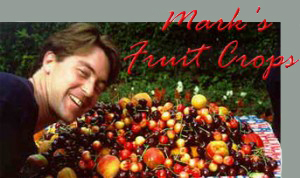 Fruits do not abscise at maturity and must be cut off by hand with a knife or machete. Fruits are harvested ideally at 1- to 2-week intervals. 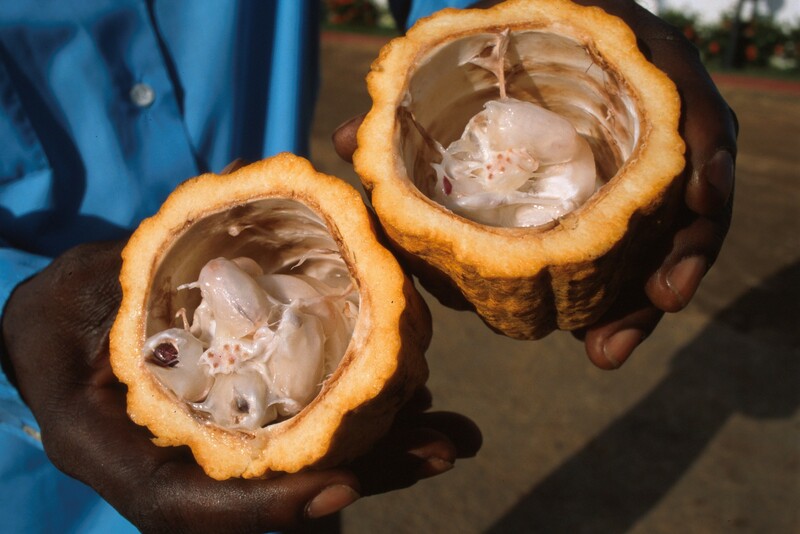 The initial processing of the seeds of the fruits into cocoa powder and chocolate consists of producing cocoa “beans” (fermented and dried seeds), which is generally done on or near the farm. Cocoa beans are then exported from producing countries and traded on world commodity markets. The second stage is far more complex and generally done in chocolate factories in the importing countries. Fruits can be stored a few days before opening, if needed. Once dried, cocoa beans can be stored for months or years at normal temperatures and relative humidity of 80 percent or less. Three major products are derived from the seeds: cocoa powder, cocoa butter, and chocolate. Cocoa butter is high in fat, with 60 percent being saturated fats (palmitic and stearic acids), 35 percent monounsaturated fats (oleic acid), and the remaining 5 percent polyunsaturated fats (linoleic acid and others). Cocoa powder has an unusually high amount of dietary fiber for a fruit-derived product, almost 30 percent. Although the protein content is high, only about 40 percent of the protein is digestible. Several forms of chocolate are produced, and a lack of strict worldwide standards has allowed the development of many different styles and brands. In the broadest sense, there are three major types based on ingredients used: white chocolate includes only cocoa butter, sugar, milk, and vanilla or other flavorings; dark chocolate contains cocoa liquor, cocoa butter, sugar, and various flavorings; and milk chocolate differs from dark only by the addition of milk. In 2002, worldwide per capita consumption of cocoa was just over 1 pound, although consumption in Europe approached 4 pounds, and in the Americas, about 2.5 pounds. About 60 percent of the world’s cocoa is consumed in Europe and the United States. In the United States, per capita chocolate consumption is 9-10 lbs per year.